With the UPLINX Remote Control for Cisco phones, you can remotely login and logout a user’s device profile for Cisco Extension Mobility. Script or perform status/login/logout operations. (Optional) If Cisco Extension Mobility is not enabled on the phone, UPLINX Phone Control Tool will now ask you for permission to change the CUCM phone's configuration to enable Extension Mobility on this phone. Search for a Cisco end user and press login. The remote phone will now reset and apply the device profile and update the logged-in user status. Next to the manual login/out per phone, bulk operations are supported for new telephony deployments or migrations to new versions of Cisco Unified Communications. For bulk operations, use the bulk wizard 'Cisco Extension Mobility' to query the status and login or logout phones from a list of phones in a CSV file. For detailed steps, please see the user guide Bulk Extension Mobility. UPLINX Remote phone control uses the CISCO Extension Mobility API to login, logout and to query the status of logged-in users on phones. So the end user's PIN is not required. Here are some of the benefits of remotely logging in to Cisco Extension Mobility profiles on a remote Cisco phone from the convenience of your desk. Login a Cisco device profile on a remote phone at a remote site. Place calls through the remote voice gateway, transfer into voicemail to test that all is working for the phone's end user. Login a new Cisco end user so that the user can immediately use their phone when arriving at their desk. Logout a Cisco device profile, modify its configuration on CUCM, and then log in the Cisco device profile again. This is required for some configuration changes to become active. Login/out of device profiles with various Cisco phone model types for testing purposes. UPLINX Remote phone control supports most Cisco phone models which support Cisco extension mobility. Please check the list of supported Cisco phones. Cisco device profiles are also supported on Cisco Expansion Modules 7914, 7915 and 7916 (12 or 24 buttons) and KEM for 8851 and 8861 phones. 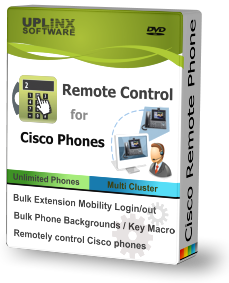 Remote phone control of a Cisco phone 8851 with uploaded background image.